As you all know, I have been around e-drumming for a while and have been doing some DIY projects with MegaDRUM, e-cajon and beta tester for AD2. One of the companies with its roots from Clavia and DDRUMS is 2Box. I have since the last 5 years been hearing alot of the 2Box module and drums. So finally, just for fun I got the chance to buy a used 2BOX module to a great price with a hi-hat control plus a ride. The idea with this initiative was to compare with what I am currently using (MegaDRUM and VSTs) and maybe get a couple of new ideas what we can extend the MD platform with. Some background – The 2Box hardware design. The module was launched in 2009 and is still the same version which ships today. Internally the module is based on a ARM processor, have 4GB on board (Which is fully stuffed from factory), have 15 trigger inputs (8 dual) and 6 + 2 sound outputs (unbalanced). The forums claims the 2Box module to be very fast – about 3ms from hit to sound. Which is extremely fast! The best feature of 2Box is the open sound system where the user can add his/her own samples. I am guessing that this is the only module except the Roland TM-2 which allows this. 2Box is supporting multilayer samples. So the concept is/has been right! After have been updating the OS on the 2BOX module and carefully been reading the manual…I just realized that the USB port is not able to send any midi. The USB port is only used for storing files and OS updates etc. To be able to use 2Box together with VSTs, you have to use it with an external midi interface. (ordinary MIDI ports with in/out is onboard). The USB port (which did not work for midi) get completely useless when upgrading to a larger SD card above 4GB. There is a hardware/OS limitation in the 2BOX module which don’t allow access larger SD cards than 4GB over USB. Accessing the card over USB will destroy it. For users that still want to access these cards the SD card, it needs to be taken out and accessed directly in a PC or MAC. But on 2Box forum, the drumguru Mr Jman has done a patch for this where you access it from outside. I have made my own implementation on a how to make an external accessible SD card – see below. The hi-hat implementation…I don’t know if the hi-hat is good or bad…but i am not a big fan of the 2Box hi-hat. I think my MegaDRUM / VH-11 is very much better. I am guessing there are room for improvements. Mr drumguru Jman has a solution on this which many 2Box users have tried instead of the original hh solution. Implement them on my 2Box module – 32 GB SD card. Patch the 2BOX and make the SD card accessible from the outside.- See my other project. Try to use my current A2E converted Sonor drumset using Quartz on harness triggers – Roland e-cymbals. The forum tells you all about the memory upgrade…be a bit cautious…otherwise it is pretty straight forward. The memory consist of a SD card…just to be able to find a right working card is the challenge. Look for old SD cards with class 10. I am using the nice SDSE tool from Lustark for converting samples from AD2. This can actually be done in just a click. It takes about 40 minutes on my i5 based PC running 64 bit version of Windows 10 BETA. The SDSE tool is a script based automatation tool which is using several different applications to create a sample for 2Box. This process would manually have taken me at least a day per AD2 kit / so it is well spent money to buy this tool! My best recommendations! So far I have converted the following AdPaks: Metal, Reel machines, Prog, Pop, Rock, Indie, Black, Dry Vintage, Retro. even the hardrock flawor of DrimMica is working fine. About 28 GB of samples! To implement the the SDSE generated samples I first copied the DKIT files and the related DSND files (Which includes the samples) to the SD Card. The SD card was prepared in anvance and all the factory settings was copied to the card. Link. Then I used the the DrumIT 5 editor and loaded the files directly from the SD card on my PC. In this scenario you are able to import DKIT files and replace some of the 100 preset kits on the SD card. In the end I did use the Drumit Manager from Lustark which gives you a better overview and better control of all settings. I replaced the positions from 90-100 with my kits….but it is also possible to add kits without changing the factory presets. The feeling is actually fantastic! The triggering worked directly out of the box for my Quartz based snare and Remo Silent Strike mesh heads. 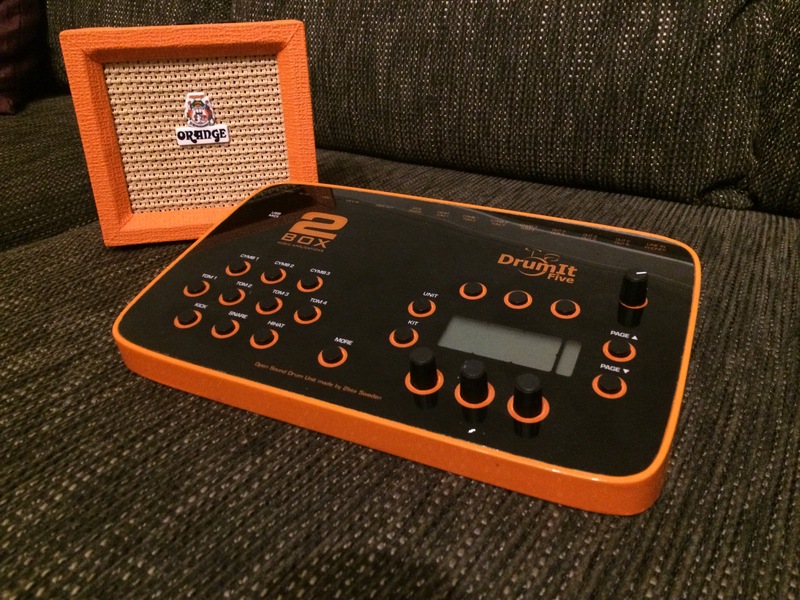 I have also tried the triggering on my PD-8X, PD-8 pads and it works ok out of the box…..and I really wonder how they do it / especially when having my adventures with MegaDRUM and configuring the right settings. To make the triggering perfect, just optimizing the gain, volume settings and you are all set. I don’t like the triggering of the 2Box hihat…where I do believe we have a better implementation in MegaDRUM with my Roland VH-11. I am still missing the positional sensing part from MegaDrum/AD2 when doing ghost hits a bit…but the feeling…is still fantastic…I will become a musician again! My AD2 converted kits do also sound fantastic! Some minor problems with hi/hat opening on most sounds…but I am guessing this can be corrected in the settings of the module. Very time consuming when dealing with your own samples…It feels like MegaDRUM and chasing the right trigger settings! The triggering part and finding the right settings is a walk in the park…even with DIY gears! The hi-hat is the weakest part in the 2Box module. Hard to configure…and is a proprietary solution using an hall sensor. To fix this and improve the hi-hat I invented my own solution – Zourman Drums (formally 42box) e Hi-hat Conversion Kit for 2box and Roland hi-hats. So now you are able to use Roland hi-hats directly with 2box! It becomes very complex with all softwares for doing a proper implementation of samples…but the saviour is the SDSE Tool. 2BOX OS 1.26 and the complete factory samples. I have lately used the 1.30.3 version. Zourman Drums (Formally 42box) Hi-hat conversion kit for Roland FD-7, 8, 9 and VH-11 and VH-12 for the 2box DrumIt Five module.